This delightful house has it all - oak beams, flagstones, underfloor geothermal heating, log fire, French doors, south facing garden, large bedroom and bathroom with shower and bath; linens and towels provided, bed made up. It's the perfect romantic getaway for two people. From the garden you can see the sun preparing to set behind the trees beyond, and listen to loads of birdsong. There is a parking space outside the front door on the 'village green'. The downstairs is one large open-plan kitchen/living/dining area; the walls have all been beautifully plastered and lime-washed with a warm but very light shade of honey. Upstairs, exposed oak beams throughout the bedroom and mezzanine enhance the recent renovation of this charming property. Our stonemason and estate agent now tell me that they both regret not having bought the house for themselves! Bill was born in Bath and having completed university in Wales, avoided working in an office by running away to operate hotel barges on the canals and rivers of France. Jenny, a Prue Leith trained chef, left London for two weeks to cover for a friend who needed a break from cooking. Both Bill and Jenny intended to move on from Burgundy, but with the addition of dogs and children and the realisation that they already lived in one of the most beautiful parts of Europe, why change a thing? For years Jenny had had her eye on this house. It hadn't been lived in for 30 years but she knew it would make the perfect holiday home; it's rare to find a charming detached house with a good garden in a pretty village. The owner was a kind man with bright eyes and a generous smile; he spoke into your face whilst enthusiastically thumping your shoulder every few seconds. There were many people whom he would not sell the house to, but luckily we did not seem to be part of this ever expanding list! Before too long we were the proud new owners, but having bought it, we had to wait a couple of years until we could afford to start renovating. And what a house it made! Every year several guests ask us if it's for sale! 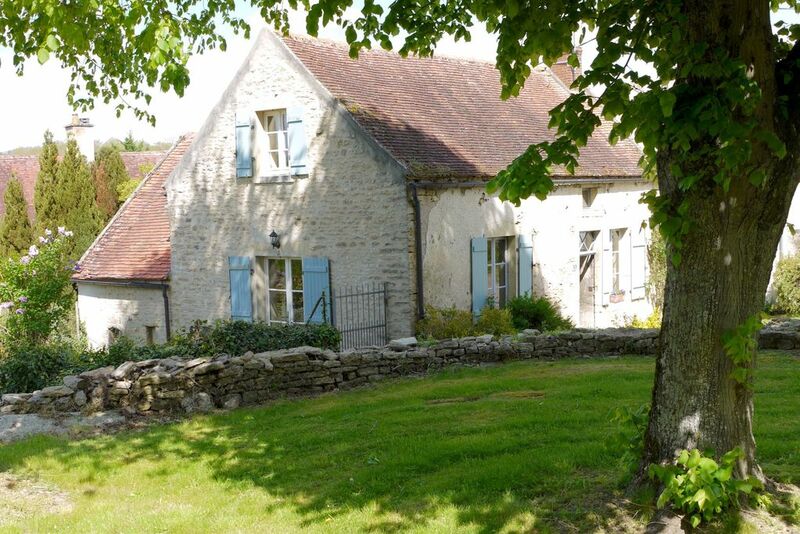 We have four rental properties in Burgundy and even if one day we sold up and left for another region, we would have to keep this one as our bolthole in the Côte d'Or; so I'm afraid the answer is: it's not for sale, but it can be reserved for you to stay in! Staying here is all about leaving the city and stepping back in time and enjoying the peaceful rural surroundings. No busy roads, trains, aeroplanes or noisy farms - even the church bells stop at night! The house is unusual because it's in the middle of the village of Corsaint and yet all around feels so spacious; that's largely due to being right next to the church and the green and also helped by having a good southerly facing garden with a view. Inside the property plays the same trick; it seems so much bigger than the exterior walls dictate. We live two minutes away from the house and are available if you need us. We hope you will discover and explore Burgundy in your own way, but if you would like a little orientation and guidance about where to go and what to do, then we would be delighted to help. Just ask! It's spacious, bright and airy with a bath, separate shower, loo and handbasin. The traditonal tomette floor whilst cool in summer, can be heated when necessary. There is geothermal heating in the house, radiators downstairs and underfloor upstairs. Sheets, duvets, pillows, pillow cases are all included - beautifully ironed and beds made up. There is a washing machine with ecological washing liquid provided. There is no garage but there is plenty of room to store bikes in the laundry room if you decide to bring them with you. There is a Godin wood burning stove with a glass front, so it's like an open fire but without the dust. It's all open plan - comfortable seating for three people. There is a TV and a range of puzzles and board games. The dishwasher is a Smeg - very quiet! There is an under counter fridge in the kitchen, plus a full size fridge/freezer in the laundry room next to the kitchen. The hob has 4 gaz rings. They have a safety cut-off should the flame go out for any reason. It's a Dualit so works well. We do not supply pantry items but are always happy to shop for you if required prior to your arrival - just ask. There is a DVD/Blueray player. There are plenty of books in the house. The essentials are there, cards, puzzles, scrabble etc. There are several CDs in the house. It's enclosed and is mostly grass and shrubs. Contains table and chairs on a terrace area right next to the French doors that lead to the kitchen. Also has a BBQ and sun loungers. Bicycles can be hired at Venarey-les-Laumes (30 minutes drive) to cycle along the tow path of the Canal de Bourgogne. There are storage facilities if you bring your own bikes. There is a fine 9 hole course near Précy-sous-Thil, a little over half an hour from the house. 18 hole course at the Château de Chailly near Pouilly-en -Auxois, about 40 minutes away. If the house is already booked for the dates that you are after, please have a look at our two other properties. They are also on this site and their reference numbers are 6396 and 1499850. Already at our arrival Bill and Jenny gave us a warm welcome. We enjoyed our stay very much in this cozy and charming cottage.Especially in the evening and night it was quiet, you could only hear some birds (and the soft chiming of the churchbells). Many interesting places and lovely villages are in easy reach. The building of a medieval castel in Guedelon, the near village Semur-en- or Flavigny, the film location of "Chocolat". Or the ancient battlefield "Alesia" where the romans beat the Gauls. We surely will return, the next time in a more lively season because in the end of Octobre many restaurants are closed in the evening. But in the nearby supermarket in Epoisses we found everything to cook our dinner ourselves in the very well equipped house. This is the third time we have stayed in this lovely gite and it was as wonderful this time as it was the first two times. It is very well appointed with all the cooking utensils and serving dishes one needs even if entertaining several guests as we did. We loved seeing the church next door lit up at night and hearing the bells chime on the hour and half hour. We hope to return again to this tranquil, idyllic setting. This was our second stay at this charming characterful and comfortable cottage that Bill and Jenny have restored lovingly and created a relaxed open plan living space. The kitchen is very well equipped and the garden outside the kitchen is private and bathed in afternoon sunshine. There is lots of information on the many attractions in the area and Bill is very knowledgeable and enjoys giving you more information if you need it. They live in a neighbouring village and when you phone Bill he happily comes round to change a bulb or deal with any other matters very promptly. We have stayed in several cottages in France and this is definitely our favourite. We had a brilliant stay at Bill and Jennys cottage. The perfect getaway in a beautiful village. Bill and Jenny were extremely helpful and helped arrange things for us. I would highly recommend this property and we look forward to returning in 2018. We had a wonderful week in Corsaint. The cottage is beautifully renovated and has all the comforts of home. Despite the cooler than expected weather we were able to enjoy sitting in the sunshine in the garden most afternoons. Then later in the evening enjoyed a glass of wine in front of the wood burning stove. Extremely relaxing. Corsaint is a very peaceful little village, and ideally located to explore the area. The surrounding countryside is beautiful and there is more than enough to see and do. A week wasn't long enough! Nearby towns of Epoisses & Semur-en-Auxois provide plenty of choice for bars, restaurants & shops. Superb walking & biking; visits to historical sites (13th C Abbaye de Fontenay, Vézelay Basilica, ); Chateaux (Epoisses, Ancy-le-Franc, Bussy-Rabutin); Medieval towns (Semur-en-Auxois, Flavigny, Noyers) ; Markets (Dijon,Chablis); Lac de Pont (small beach,watersports); Morvan National Park, Golf & Tennis nearby. 5 hour drive from Calais or Zeebrugge. 1 hour TGV train to Paris or Euro Disney direct. The rental price includes geothermal heating when necessary. There is a small additional charge for logs for the fire. We kindly request that guests do not smoke inside the house. We accept up to two dogs (supplement of 30 euros).